The Americans (FX) and The Catch (ABC) have both violated character naming rule #1 – Make the Name Age Appropriate. 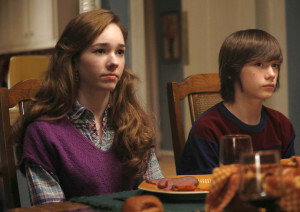 In the FX period series The Americans, Philip and Elizabeth Jennings have two kids, a boy named Henry and a girl named Paige. Paige is a high schooler in the late 70’s-early 80’s, which would make her about my age (52). Paige and Henry are popular names for babies in the last five to ten years, but the names did not appear on the charts in the 1960s, when the Jennings children would be born. Considering that the parents would have wanted to fit in and seem as “American” as possible, it would have been uncharacteristic to have chosen baby names that were not on the top of the charts. They’d want to use popular American baby names, most probably those in the top ten like Michael and Lisa, John and Karen, or David and Kimberly. Now the parents’ names are fabricated, as they were renamed when they moved from Russia to America as young spies. So Philip and Elizabeth would have been fine, especially since Elizabeth is a timeless name. The same holds true with the new ABC series, The Catch, starring Mireille Enos and Peter Krause. Mireille, herself, is 41 and assuming that her character is close to the same age, then she probably would not have been named Alice. The name Alice was in the top 20 in U.S. births from 1900 until about 1940 when it dropped in popularity until the past couple of years. It only just hit the top 100, again, in 2014. It would have been extremely uncommon for a girl in the 1970s to have been given the name. That’s not to say it didn’t happen, of course it did. But it would have been more believable if her name was say, Jennifer, or Jessica. Rita is also a name that’s dated far older than the character, played by actress/model Jamie VanDyke, who’s in her mid-20s. Krause’s character, being a con man, doesn’t have a set name but takes on the identities of a multitude of other men. The subtitles put his name as Ben/Benjamin, which is a pretty timeless name and could fit for a man his age.